Monday was a day to remember for New Orleans Hornets fans. For starters, Louisiana Governor Bobby Jindal announced at a pregame news conference that the team had met attendance goals, securing its home in New Orleans for at least another year. Then, during the game, it was announced that the team had sold out the Hive for the second time in a row, after doing so only twice in the first 22 games. The baby in the king cake came when David West dropped a 19-foot game-winning fadeaway over Serge Ibaka with half a second left in the Hornets' 91-89 win over the Oklahoma City Thunder. The thrilling victory was the ninth in a row for the Hornets, who are the NBA's hottest team for the second time this season. It catapulted them from fifth to third in the Western Conference standings, ahead of both Oklahoma City and divisional rival Dallas. It also may prove to be the game that officially cements them in the minds of national basketball fans. The Hornets have been successful this season despite playing the third-hardest schedule in the league. Although the margin of victory against Oklahoma City wasn't on par with their previous destructions of San Antonio (24 points) and Atlanta (41 points), it may be more telling about who they are as a team going forward. As easy as it is to look at the most recent stretch and say the Hornets are contenders, it's simply not correct. You don't need to look twice at San Antonio's lineup to know that it shouldn't get destroyed by the Hornets. On paper, San Antonio is the superior team, and although the season series was split, you will be hard-pressed to find a basketball expert who will agree that the Hornets are as good as the Spurs, let alone better. There's a reason for that, and it's not that the media is biased against New Orleans, like so many Hornets fans truly believe. A quick look at the Hornets' frontcourt reserves reveals all anyone needs to know. Jason Smith, D.J. Mbenga, Aaron Gray, Quincy Pondexter and David Andersen are not capable of carrying a bench through the playoffs. Even if Emeka Okafor and West can avoid foul trouble or injury for the rest of the season and postseason, there are still going to be times when the Hornets will have to turn to the weaker portion of a bench widely criticized as the league's worst. It would seem a simple enough problem to fix, especially since their main trade asset is a $9 million trade exception, but things got a little trickier once the league took control. With the other 29 owners floating the Hornets' tab, it's a certainty they won't be allowed to go over the luxury-tax line. It's less clear whether they would be allowed to add salary if the right deal came along, but the decline in trade chatter coming from GM Dell Demps' office leads one to believe otherwise. Since most available big men command a high salary, and the Hornets are at the very least discouraged from adding salary, the Hornets would have to find a way to even out the deal. Unfortunately they already traded away their first-round pick for the upcoming year, and with the future of Chris Paul and West (who will opt out this summer) not solidified, it would be a shortsighted move to trade future first-round picks. Without any real expendable trade asset on the roster, a deal becomes even harder. Hornets coach Monty Williams has been phenomenal so far at utilizing what he has to work with, running a small-ball, three-guard lineup off the bench more often than not, and forcing other teams to play to his strengths. He's gotten 100 percent out of Paul, West and Okafor, and might even earn himself a chance at coach of the year in the process, but unless something changes, there will come a time when the Hornets will simply be overmatched in the frontcourt. That's something no coach can fix. How deep a run the Hornets make this year is dependent on what Demps can do before the trade deadline to remedy the Hornets' most glaring problem. NEW YORK -- The NBA trade deadline is exactly one month away, and the Miami Heat are coming to town Thursday night to show the Knicks exactly how far they are or aren't from being able to compete with an elite team. All the Knicks showed Monday night is that they are capable of disposing of the trash. And it was interesting afterward -- especially after Amare Stoudemire had another 30-point game, Raymond Felton had 17 points and 15 assists and Danilo Gallinari scored 17 -- that coach Mike D'Antoni singled Wilson Chandler out for praise. Pumping up your biggest trade asset, Coach? "First quarter he was definitely hesitating and I was worried about him, but then he came back and played great," D'Antoni said after Chandler recovered from an 0-for-4 first quarter to finish with four 3-pointers, 25 points and seven rebounds in a 115-106 victory over the Washington Wizards on Monday night. "Maybe he hit bottom and came back up, but he -- like I said before, is really important to our team, and hopefully he stays right where he is." By "staying right where he is," one was left to discern whether D'Antoni meant talent-wise or location-wise. Chandler had missed more than half of his shots in each of the Knicks' six consecutive losses that they entered this game with, lowering his value at a time when the Knicks are secretly hoping he can be one of the key pieces of the puzzle in their quest to acquire Carmelo Anthony from Denver. The Nuggets are being "polite" to the Knicks in their discussions regarding an Anthony trade, a league source told ESPN.com, but it seems Denver wants to see how it fares on a critical five-game Eastern road swing in which they will face nothing but bottom-feeders -- the Wizards on Tuesday, followed by the Pistons, Cavaliers, Sixers and Nets. A 5-0 trip would make the Nuggets 30-18 and strengthen their hold on a playoff spot, which could prompt them to call Anthony's bluff, refuse to trade him, take their chances in the postseason and then see if he really has the guts to turn down the $65 million extension that is sitting on the table -- along with the $18 million he is under contract to earn next season -- and become an unrestricted free agent going into a summer in which, because of the NBA's unsettled labor situation, no one yet knows what the financial landscape will look like. • Read the rest of Sheridan's story at ESPN New York.com. Thaddeus Young, Sixers: Threw down an alley-oop jam that impressed a Philly crowd that could be called long-suffering -- but perhaps not for much longer. He scored 24 off the bench on 11-for-17 shooting in a win over the Suns. Extinct Raptors record: The Raptors finished 0-for-13 from 3-point range in a 100-98 loss to Memphis, failing to make a 3 for the first time in 986 games. The Raptors are the first team in NBA history to make a 3 in 900 consecutive games. Wiz forward after a 115-106 loss in New York dropped D.C. to 0-21 on the road. "If there's a loose ball now, how often do they get to it? The reason you can't play defense is because you can't." CHICAGO -- All right, be honest. Did anyone think these words would be uttered about Kurt Thomas after a Chicago Bulls game this season? "He's the reason why we won tonight," said Derrick Rose, after the Bulls finished off a 93-82 win over the Milwaukee Bucks on Monday night at the United Center. Thomas poured in a team-high 22 points, nine rebounds and five assists as the Bulls won their third game in a row. It's hard to decipher which is most stunning -- Thomas' effort or the fact that the Bulls are now 17 games over .500. Neither one shocks Rose and his teammates. They weren't surprised by Thomas' performance and they certainly don't seem to be surprised to hold a 13-game lead in the Central Division. 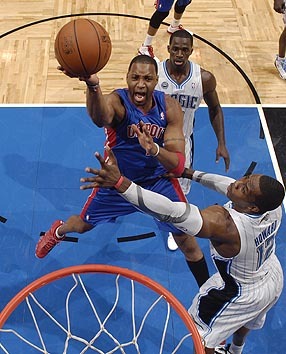 Tracy McGrady, who played for the Magic from 2000-04, scored 14 points in the first quarter to help send the Pistons to a 103-96 win in Orlando. Not only did Rudy Gay hit the game-winning basket with less than one second to play, he then blocked a potential game-winning shot at the other end of the court. The last player to hit a game-winning field goal (one that put his team ahead to stay) in the last 10 seconds of a game and then block a potential game-tying or game-winning field goal was Amare Stoudemire for Phoenix against Sacramento on Nov. 14, 2008. Stoudemire broke a tie with 4.3 seconds left in overtime and then blocked two shots in the dying seconds.